When the Church celebrates a special ʻFeastʼ or ʻSolemnityʼ it is frequently the result of controversy. The origin of this feast dates to the 12th Century responding to debate about the true presence of Jesus in the Eucharist. When was the first time you can remember debating and seeking to understand Jesus truly present with the gift of his body and blood in the Mass? 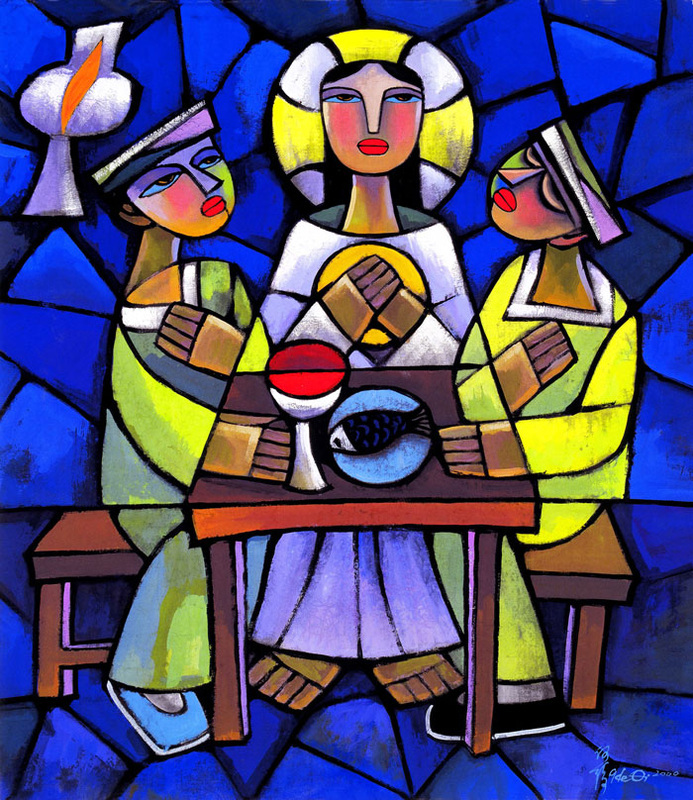 How would you describe and share this eucharistic faith with a friend today? Melchizedek, King of Salem is a very mysterious figure without a genealogy. By his actions he is both King and Priest. And Salem is known as the future city of Jerusalem – the dwelling place of God the Most High for Israel. Abraham has just returned from overcoming 4 kings and rescuing Lot and all his possessions. A King was normally wary of such a visitor as Abraham. They would show welcome by tending to the wounded – hoping that their ʻkingdomʼ would not be pillaged by the visiting army. Strikingly Abraham who represents Godʼs people, offers this Priest / King a tenth of all his possessions! Many writers comment Melchizedek is a sign of an altogether new and divine priesthood able to confer a special blessing from God. How do you understand the Priesthood today? Paulʼs letter to the Corinthians is the earliest writing we have of the celebration of the Eucharist (15-20 years before the first gospel). Paul shares this ʻtraditionʼ (which means ʻhanding onʼ) comes from Jesus himself. We are told to ʻDo thisʼ. For Jewish people, to do a ritual liturgical action in ʻremembranceʼ was to actually enter and receive the event celebrated. Paul shares the Eucharist proclaims and makes present the cross and victory of Jesus. We receive Godʼs forgiveness but also intimate communion. What does receiving ʻholy communionʼ mean for you? through Moses. Jesus now feeds the hungry, sick, and poor of Israel. Godʼs hospitality and Jesusʼ mission is shown. Jesus gets the 12 Apostles to serve the banquet. What might this teach us about the mission of the church in the world to the hungry? The Eucharist? The disciples attitude was one of inward focus and concern, ʻturn them awayʼ we donʼt have enough resources. As you receive Jesusʼ body and blood will your attitude be one of simply ʻlookingʼ? selfishly ʻgettingʼ? generously self offering?